Apply an inverse sinc function shaping filter in the continuous-time domain. Correct for the droop before the signal emerges from the DAC. The system block diagram is shown here. 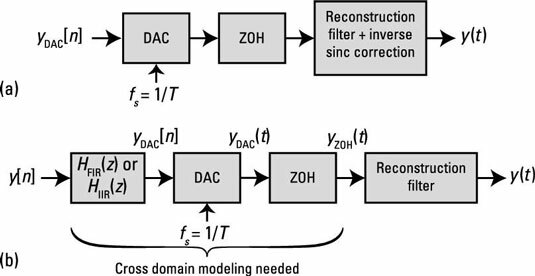 You can assume that the analog reconstruction filter removes signal spectra beyond fs/2. The cascade result is now established. To verify the performance, evaluate the sinc function and the FIR responses by using the SciPy signal.freqz() function approach of the frequency domain recipe. Check out the results in the following figure. These results are quite impressive for such simple correction filters. The goal is to get flatness that’s near 0 dB from 0 to π rad/sample (0 to 0.5 normalized). 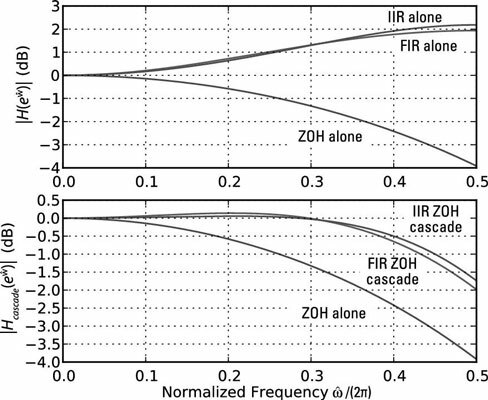 The response is flat to within 0.5 dB out to 0.4 rad/sample for the IIR filter; it’s a little worse for the FIR filter.